WASHINGTON — Most Americans say it would be OK to use gene-editing technology to create babies protected against a variety of diseases — but a new poll finds they'd draw the line at changing DNA so children are born smarter, faster or taller. A month after startling claims of the births of the world's first gene-edited babies in China, the poll by The Associated Press-NORC Center for Public Affairs Research finds people are torn between the medical promise of a technology powerful enough to alter human heredity and concerns over whether it will be used ethically. 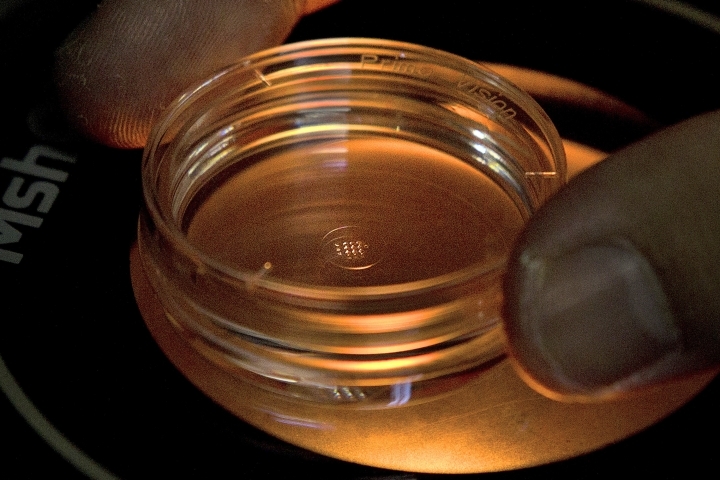 Jaron Keener, a 31-year-old exhibit designer at Pittsburgh's Carnegie Museum of Natural History, said he's opposed to "rich people being able to create designer babies." Lupus has been "a looming presence my entire life. I've been around somebody with a chronic illness and I've seen the toll that has taken, not just on her life, but the life of my family," he said. But editing genes in eggs, sperm or embryos would alter the resulting child in ways that can be passed to future generations — a step with such profound implications that international science guidelines say it shouldn't be tested in human pregnancies until more lab-based research determines it's safe to try. The AP-NORC poll shows about 7 in 10 Americans favor one day using gene-editing technology to prevent an incurable or fatal disease a child otherwise would inherit, such as cystic fibrosis or Huntington's disease. "It's one thing to look at the extremes of fatal diseases versus cosmetic things, but in the middle are going to be these very different issues," Klitzman said. "That's a good question," said Keener, the Pittsburgh museum worker, who opposes such funding for fear that research would lead to designer babies rather than fighting disease. "If there would be a way to narrow the scope of research, I would be OK with government funding," he said. "I just don't have a lot of confidence people wouldn't use it for their own gain." Indeed, the poll uncovers a lack of trust in science: About a third think this kind of gene editing will be used before it's adequately tested, as many scientists say happened in China. Nearly 9 in 10 people think the technology will be used for unethical reasons, including 52 percent who say this is very likely to happen. And roughly three-quarters of Americans say gene editing probably wouldn't be affordable for the average person — raising the specter of certain genetic diseases becoming a problem only for the poor. "People appear to realize there's a major question of how we should oversee and monitor use of this technology if and when it becomes available," said Columbia's Klitzman. "What is safe enough? And who will determine that? The government? Or clinicians who say, 'Look, we did it in Country X a few times and it seems to be effective.'" AP reporters Carla K. Johnson in Seattle and Hannah Fingerhut in Washington contributed to this report.